If you spend any time at all on Twitter, you’ll have noticed the newly trending hashtag #MentalHealthAwarenessWeek. This week is, you’ve guessed it, Mental Health Awareness Week, and is dedicated to reducing the stigma around mental heath. In particular the estimated 1 in 3 school children thought to be suffering with a mental health condition of some kind. There’s been a lot in the news recently about this, and even the Princes William and Harry have been getting involved. So to, has Event projection. 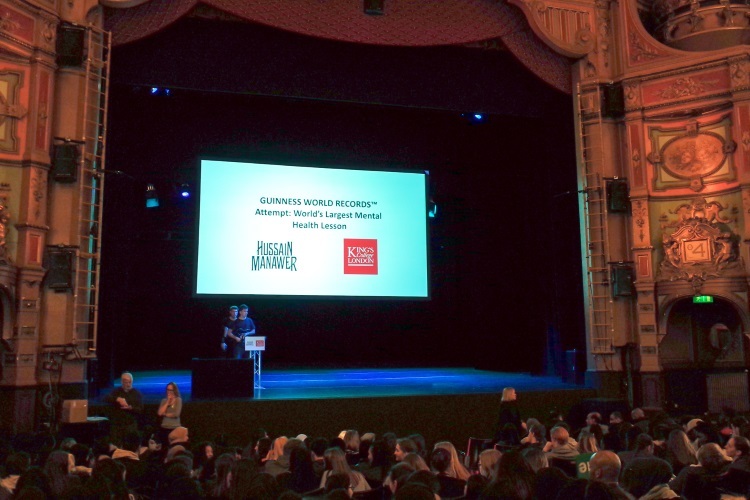 Back in March, we spent a day at London’s Hackey Empire, along with poet, astronaut-in-training and mental health campaigner Hussain Manawer, and King’s College London’s Professor Dame Til Wykes. Their aim? To break the world record for the world’s largest mental health lesson, and in doing so to raise awareness and reduce stigma around mental health in young people. We were there providing a large screen and projector to provide the backdrop to the lesson. The Guinness World Records rules requiring the class to be taught by a suitably qualified health care professional and in accordance with current national or international guidelines. 538 pupils from 14 local schools took part in the 30 minute class. There was also a performance of an exclusive 20-minute poetry set from Hussain, featuring some very special guests. Many famous faces attended the show, hosted by 4Music presenter Maya Jama, including Jonny Labey and Danny Boy Hatchard from Eastenders, Jordan Stephens from Rizzle Kicks, rap stars WSTRN and Sneakbo, singer Sinead Harnett and YouTube personality Humza Arshad. An adjudicator from The Guiness World Records was also present, and verified that the world record had indeed been broken! Congratulations to Hussain Manawer and Dame Til Wykes. You can read more about the world’s largest mental health lesson at the Guinness World Records website.